Whether you’re a scrapbooker, an artist or a floral arranger, whether you like to make jewelry or handmade cards, you no doubt need to visit a craft store frequently in order to stock up on supplies. The following New Hampshire craft stores carry some—if not all—of the craft supplies you need. Check one out the next time your craft closet is looking bare! 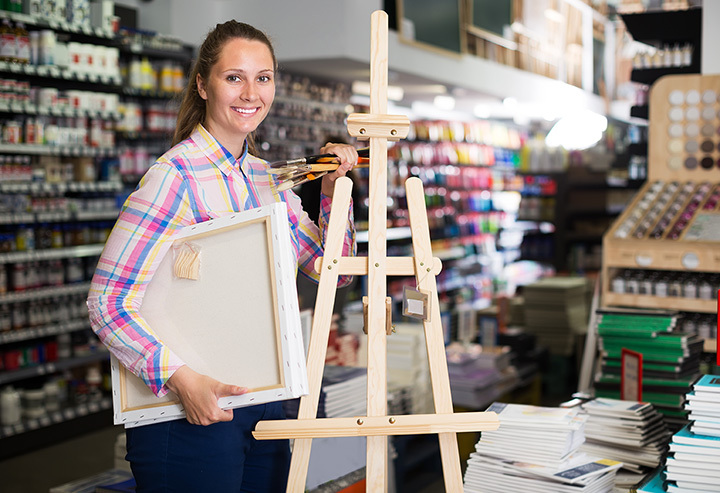 Featuring art supplies, card-making supplies, rubber stamping items, kid’s crafts and more, Art Plus is your go-to place in Concord for crafting items. In addition, they’ll custom frame your artwork and they occasionally offer classes or workshops for crafters and artists. Only in Raymond, New Hampshire, are you likely to find a craft store inside an Ace Hardware store. Featuring fabric, paper supplies for cards and scrapbooks, yarn, candy making supplies, candle making supplies and a large selection of faux flowers and plants, any crafter will love the variety they find at this store. They also frequently host crafting workshops. From candy making and painting to scrapbooking and making jewelry, Michaels sells it all—and more. Check the local Sunday papers for valuable coupons each week. Ask about upcoming classes and workshops, too. Backroom Art Supplies caters to a variety of artists, including crafters. Featuring paints, papers, rubber stamps and more, they also host regular classes and will custom frame any kind of artwork. AC Moore carries an extensive line of craft supplies for all sorts of crafters. From paper and embellishments for scrapbooking to canvasses, paints and brushes for the artist, they have it all. Ask about upcoming demonstrations and classes for kids. Carrying a wide array of supplies for paper crafts—including scrapbooking and card making—Cropaholics frequently hosts scrapbooking workshops. In addition, they have a crop room, where everyone is welcome to bring their projects and enjoy the company of others while working on them. A girl can never have too much washi tape!